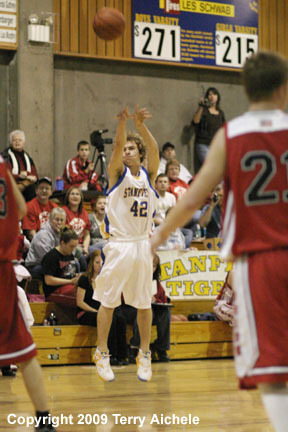 Calvin Stout of Union takes a shot during the game Saturday night. 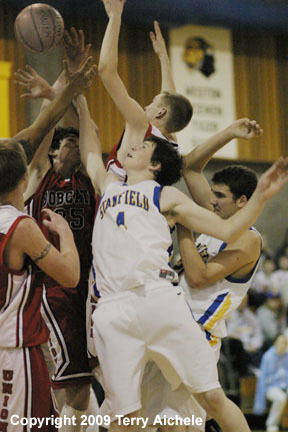 STANFIELD - The Union Bobcats narrowly defeated the Stanfield Tigers 58-56 in a tightly played game on Saturday, January 10, 2009. Stanfield lead throughout the first period with the score at the end of the first 12-9. The Union Bobcats outscored Stanfield 12-8 to take a 21-20 lead at halftime. 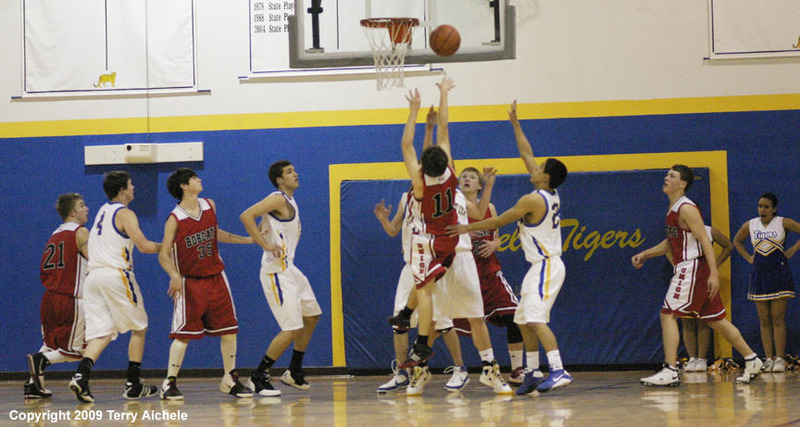 Tiger's had good play by Chase Erwert, Quin Grogan, and Robbie Shirley during the first half. The third period was higher scoring than either first half period. Stanfield tied it up at the end of the third 38-38. Hot shooting Tigers included Shirley, Grogan, Erwert, and Kameron Watson. 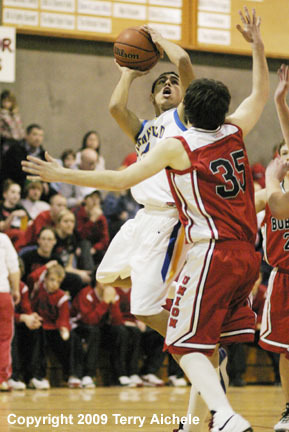 LEFT - Tyler Hawkins of Stanfield takes a shot Union's Kyle Langford. 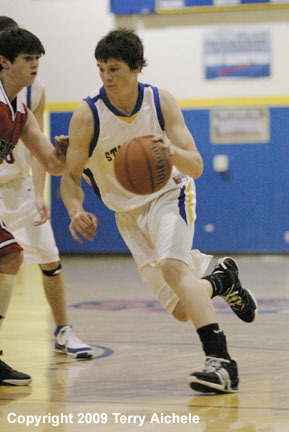 RIGHT - Quin Grogan of Stanfield drives to the basket. 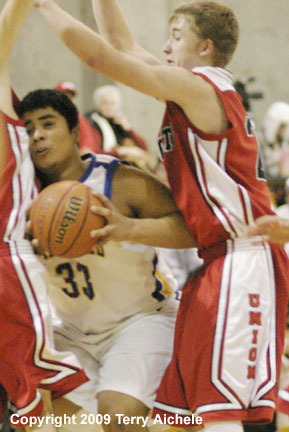 LEFT - Stanfield's Omar Ibarra gets squeezed between two Union defenders. 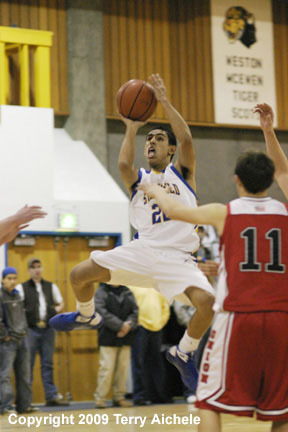 RIGHT - Hector Esquivel of Stanfield takes a shot. 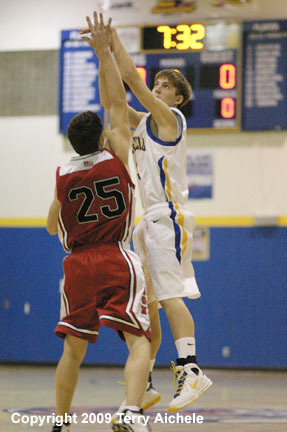 LEFT - Koty Kamm of Stanfield takes a shot during the game with Union on Saturday night. 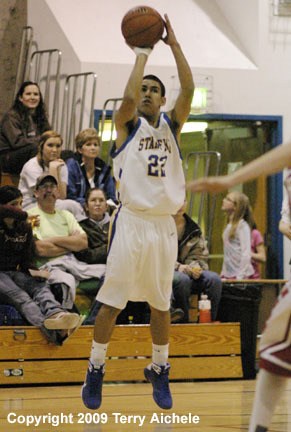 RIGHT - Hector Esquivel of Stanfield takes a shot.